"We Make Memories More Beautiful with Flowers." September 2014 marked the 55th Anniversary of DVFlora (formerly Delaware Valley Wholesale Florist). 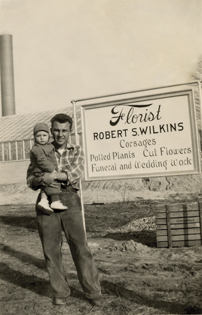 Bob Sr. and Doris Wilkins started Delaware Valley Wholesale Florist back in 1959, but they actually had their beginnings in the floral industry about twelve years earlier. Just about four miles up the road from our current Sewell, NJ location; Bob had a small retail flower business and grew his flowers and plants in three greenhouses. He also sold his cut flowers to wholesale florists at the Philadelphia Flower Market on Ludlow Street. The story goes that after several years, one of the floral wholesalers asked him to become a flower salesman for their company. He excelled in that position, and after a number of years, Bob and Doris began to think about starting their own wholesale florist business in Southern New Jersey. When the decision was finally made, they sold their home, purchased a truck, leased a small building in Pitman, NJ, and DV was born. At that time, they shared one desk and one adding machine. The company opened its doors on September 22, 1959. When Bob started DV over 50 years ago, he had no idea his dream would grow into what it has become today: the Delaware Valley Floral Group, which is one of the largest floral distribution and logistics companies in the United States. Over the past 50 years DV has been blessed with three generations of family members, committed employees, loyal customers, and supportive suppliers and many other business associates. In no small measure the combination of all of these makes us what we are today. We thank all of our business associates who have helped us over the years.